Although all pond installations do have some common techniques used throughout the process, the final appearance can vary greatly. Your own imagination and taste will give you the final product that you will use and enjoy throughout the year.. 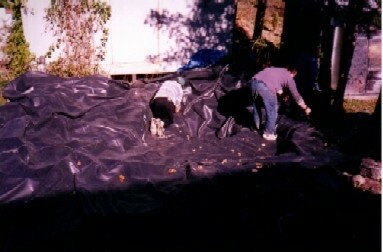 This is an example of a Pond Liner installation. This is an example of a Preformed Liner installation. One of our pond projects. 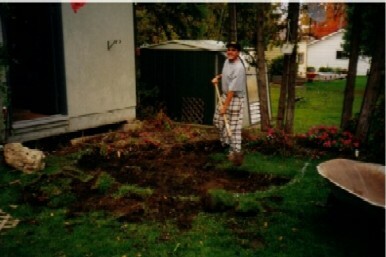 This project greatly enhanced a previously unused part of the yard. It was behind a garden shed where unused equipment was traditionally stored. It transformed a section of the yard that the owners kept guests from seeing into a showpiece. Not only the guests get to enjoy it but the owners now can kickback and relax and enjoy the setting. 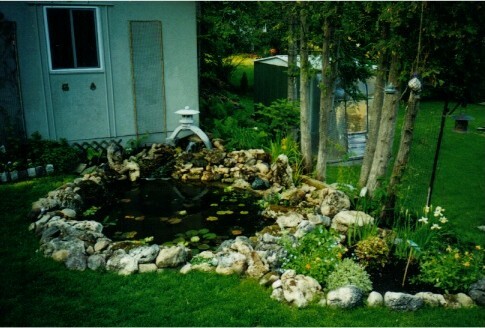 This is an informal style liner pond with a bog garden connected to the pond. The bog gets water when the pond owner exchanges some water. The concealment of wires and tubes was made easier locating the pond near the garden shed. A little charm was added to the shed and gave it a Japanese type theme.